Kirbie Nicole Brittain was born on May 10, 1993. At the age of 8, Kirbie was diagnosed with Ewing's Sarcoma bone cancer in her left leg and ankle. She underwent many surgeries and a year-long chemotherapy regimen before suffering heart and lung failure at age 9. The effects of the chemotherapy caused her heart to slowly deteriorate, requiring the need for a heart transplant. 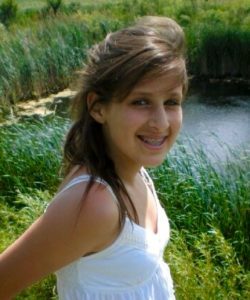 At age 13, she received her new heart which allowed her body to start growing and maturing as she grew into a beautiful young lady, both inside and out. While on vacation in 2008, Kirbie again was struck with a heart virus, causing her to go into cardiac arrest. After courageously fighting for 16 days, she passed away on September 1, 2008. Kirbie's parents, Rodney and Joni Brittain, established the Friends of Kirbie Scholarship Fund at Illinois Prairie Community Foundation in memory of Kirbie's spirit, positive attitude, genuine love for all people, and unselfish caring drive to always put others before her challenges. The goal of the scholarship fund is to award five $1,000 scholarships annually to a graduating senior at each of the five local high schools - Bloomington High School, Central Catholic High School, Normal Community High School, Normal West Community High School and University High School. If you would like to help the Brittain family meet this goal, please donate onlin by clicking on the Donate button below. If you prefer to make a donation in another manner, click here for information.